This hotel is located in the modern area of the city of Cartagena de Indias, in the neighborhood known as "Bocagrande". The hotel just opened its doors this past December of 2016, so its facilities are sleek and brand new. Overlooking the Caribbean Sea, this upmarket hotel is 4 km from the 17th-century Castillo San Felipe de Barajas hilltop fortress and 2 km from the Museo Histórico de Cartagena de Indias. Understated rooms come with free Wi-Fi, flat-screen TVs and floor-to-ceiling windows. 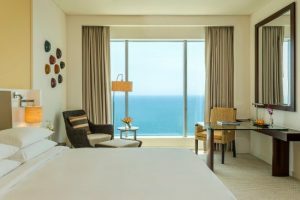 Upgraded rooms add sea views. Club rooms provide access to a private lounge with freebies such as breakfast and cocktail hours. Suites offer separate living rooms. The following discounted rates have been negotiated with the Hyatt Regency Hotel for our guests. These rates apply for stays from May 26th to June 10th, 2017. Below you will find the rates per night according to different types of rooms. To reserve please send your inquiry via email to Estefanía Gómez at estefania.gomezquintero@hyatt.com and reference "Boda Ximena y Matt" in the subject. She will need to know arrival/departure dates and the number of people staying in the room. The hotel will pre-charge the total amount of your stay on April 5th, 2017. Cancellations after this date are subjected to 100% penalty.